Microsoft’s Bing is one of the most famous and widely used search engines in the world. It’s at the 2nd position after Google. Google, being the most widely used search engine has an impressive search market share of over 65%. Bing’s market share is about 17%. Google can be considered as the daddy of all search engines, and Bing is trying to catch up with Google. Microsoft’s Engineers are working day and night to improve their search portal. If you prefer using Bing or if you love it, you may want to make Bing homepage and default search engine on your Browser. If you don’t know how to do this, just go through the below tutorials. We’ve shared a tutorial for all three major browsers, i.e., Firefox, Internet Explorer, and Google Chrome. Step 1: – From Firefox’s menu bar, click on the Tools menu and then select the options sub menu. Step 2: – Now, Firefox will open its Option Window in which there’s a text box in front of the Home Page label. In that text box, just enter http://bing.com and click the OK button to save your settings and make Bing home page on your Firefox browser. Step 3: – Restart the browser. Done! Now whenever you open firefox, you’ll see the Bing home page. If you’ve reset the settings of the browser, follow the same steps to make bing as default search engine. You can now search for information using Bing. Apart from the home page, you can also type your search query into the search box. See below screenshot for more information. Recommended reading: HOW TO SEARCH ON BING FROM DESKTOP WITHOUT MAKING IT HOMEPAGE? Step 1: – From the top right corner of Google Chrome, select the tiles icon (as shown in the below screenshot) and select the settings menu from the popup menu. 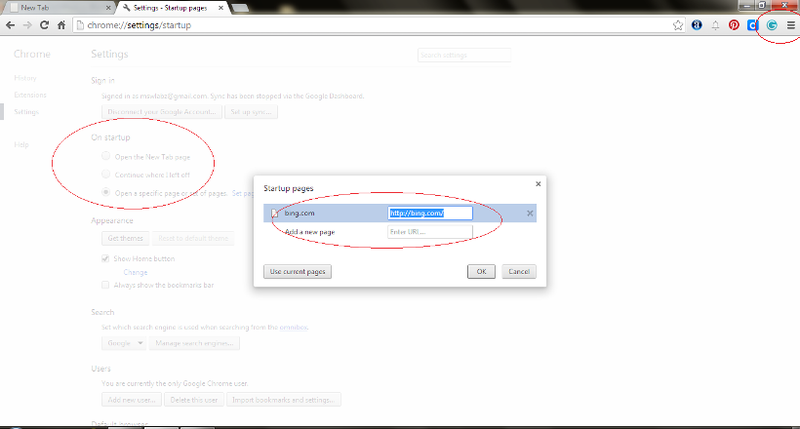 Step 2: – After clicking on the settings menu, you’ll be able to see the Google Chrome’s settings page. From this page, select the “Open a specific page or set of pages” from the list of options that appears below the “On Startup ” text. Step 3: – Now you’ll be able to see a dialog box with a text field in it. Just enter http://bing.com in it and click on the O.K button. Step 4: – To make Bing the default search engine, click on the drop down list that appears in front of Manage Search Engines button. Now choose Bing from the list. Step 5: – Restart the browser. Please share this post with your friends if you’ve found it useful. I set Bing as my homepage and search engine. I really love it, for awhile at least. Then this unexpected horrible day arrived all of a sudden. My home page is there but on my search page the image is gone. I do enjoy taking he quiz daily and the home screen page from Bing is there as well. It helps a lot in answering the quizzes if the daily bing image is there. the daily bing image is still on the start homepage but it is gone when I do the search page. It usually there all the time. Yesterday was beautiful day for me because it was there, but today it’s gone. Is there a way to bring it the way it was? I hope you and or the community have solution for this. I can’t bring this to an IT store because the consulting fee is higher than the cost of my computer. These people should be taxed highly. They are not doctors, Attys. etc that go to schools for many years…sorry, just my frustration. let’s just go back to my current predicament. Oh, I am using win 8.1. I do not like win 10. so I switch back to my win 8.1. Thank you Pramod and to the community who can help. I WANT BING ONLY AND NO OTHER AND DON’T WASTE YOUR TIME ON FORCING ME TO USE YOUR G…..E, F……X, W.B,COM ETC. CANNOT FIGURE IT OUT. YOU COULD MAKE IT SIMPLE. THEREFORE, I AM STUCK IN FACEBOOK AS HOME PAGE???? SINCE UPDATE. NOT EVEN FB PAGE BUT OFF SCREEN. TIME TO GET RID OF BING. IT’S NOT STANDING UP FOR BING FANS. KISS OFF. You can easily change the default browser in Windows. Which version of Windows are you using? I would like to use IE and Bing only, or can I just use Bing itself without IE. It seemed like IE recently is not agreeing with my Bing. Now the maker of my computer made their product and web.com as my default browser and it messed up all the time with my Bing as my browser. It would not allow me to replaced it with Bing as my default homepage/browse rand or search engine. There were times I am ale to make Bing as my homepage and search engine but I cannot remove the annoying maker of my computer and web.com. It set it selves as my default and I believed it continue running on the background. There was a time I am so happy to open my computer and there is Bing taking me all over the world with other educational information like science, nature and anything under the sun and Bing make everything look interesting and make everything look like a nice piece of art even an ordinary stone. Kindly respond on this post so that it may help others, just in case. Thank you so much for your time and help on whatever help you can share on this post to help others with similar predicaments. I have always used Bing at home even at my workplace. Our IT set up all our computer browser and search default all computers at work. Some friends worry to use other search engines as they fear their privacy is lost with them, but I do not worry about this. What is meant by awaiting moderation on my comment? Please, explain to me in simple term. Thank you. LOOKING FORWARD TO WORKING WITH BING AND EARNING REWARDS! I truly agree with your points comaparing between google and bing. In near future you will get to see lot of hike in the popularity of bing . Thanks for your view. First of all I had no clue that Bing was that popular. I personally don’t ever use Bing for anything. Maybe I should start using it. I still find myself going to Google for everything and it is currently set as my homepage. Maybe I need to start looking at using Bing. I guess it’s just what we get used to…thanks for sharing and I hope you have a wonderful day. This is indeed a nice tutorial and it was sure understandable :). Then Google was my default homepage but now i made my blog url the default homepage. The reason i made my blog my browser homepage is because i visit my blog more than Google or Bing :). If i want to search for stuff, i use the search bar located at the side of the address bar. But i use Bing webmaster for my keyword research and other seo practices. I did not know BIng was the second most popular. That is still a real difference between Google and Bing though but iI guess in the scheme of things 17% is good.